Observers in the British Isles and Western Europe wishing to see the waning Moon meet both Jupiter and Saturn should seek unobstructed view of the horizon from southeast through south some 45 minutes before sunrise from 27–29 March 2019. The Moon occults Saturn as seen from South Africa around nautical dawn on Friday, 29 March. AN animation by Ade Ashford. Now that the waning Moon is rising after midnight, deep-sky observers in the UK and Western Europe can rejoice at the return of dark evening skies for hunting down a wide variety of extragalactic deep-sky objects (some described here). For lunar and planetary enthusiasts, however, the only naked-eye planet of the evening sky is distant and tiny Mars in the constellation of Taurus. But if you’re prepared to be an early riser, the dawn sky is where you’ll find two of the solar system’s heavyweights, Jupiter and Saturn. 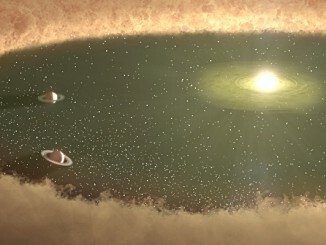 Jupiter, the largest planet, currently lies in Ophiuchus, the unofficial 13th zodiacal constellation. Presently shining at magnitude -2.2 and therefore the brightest object in the dawn sky other than the Moon, Jupiter can be found low in the southern sky at the onset of civil twilight some 35 minutes before sunrise in the UK. On the morning of Wednesday, 27 March around 5am GMT you can find Jupiter just 1½ degrees to the lower right of the 21-day-old waning gibbous Moon. Hence the Moon and planet will just fit in the same field of view of binoculars and telescopes magnifying 30× or less. In higher magnification instruments you’ll see that Jupiter appears to have only two Galilean moons at this time – Callisto to the east and Ganymede to the right. (Io is behind Jupiter and Europa is eclipsed by the planet’s shadow). Two mornings later, it’s magnitude +0.6 Saturn’s turn to get somewhat closer to the waning Moon. If you look very low in the south-southeast at 5am GMT on Friday, 29 March you can see the 23-day-old lunar crescent just two Moon widths below the ringed planet. Saturn’s largest and brightest moon, magnitude +9 Titan, happens to be close to greatest elongation this particular morning, some 4&frac13; ring diameters east of its parent planet. As seen from more southerly latitudes, specifically South Africa, the Moon actually occults (passes in front of) Saturn around nautical dawn on Friday, 29 March. 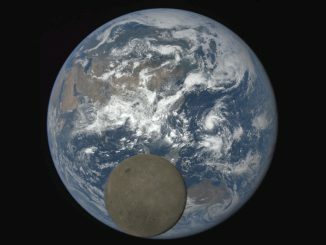 On 5 July 2016, the Moon passed between the National Oceanic and Atmospheric Administration’s DSCOVR satellite and Earth. NASA’s EPIC camera aboard DSCOVR snapped these images over a period of about four hours. In this set, the far side of the Moon, which is never seen from Earth, passes by. The last time EPIC captured this event was 16-17 July 2015. NASA’s Cassini spacecraft has observed geysers erupting on Saturn’s icy moon Enceladus since 2005, but the process that drives and sustains these eruptions has remained a mystery. 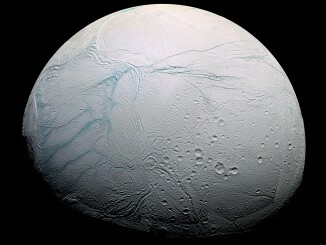 Now, scientists have pinpointed a mechanism by which cyclical tidal stresses exerted by Saturn can drive Enceladus’s long-lived eruptions.